Earning money is not an easy task in this era and if the word “free” can be tagged with the “word” money, some goose bumps are certainly anticipated. FreeMyApps is one of those applications that will render you rewards for no work but play. It is an incentivized download system that helps its users in earning points, which helps in getting them paid apps free of cost. JunoWallet, Appcasher etc. are some of the most trusted applications of the same arena but FreeMyApps is steadily making its place in the top-notch incentive provider apps. FreeMyApps is available for both iOS and Android users without any cost. It provides some of the highest payouts with “no work just for fun” attitude. The question “Is FreeMyApps safe?” is quite commonly asked on different forums and web. Nobody can predict the future of this app. However, until now, it is highly secure and legitimate app. The company is in operation for over many years and nobody yet complained about the legitimacy of this app. Rewards are paid as per described by the company. On this ground, it can not be wrong to say that FreeMyApps is legitimate by watching the company’s progress and dedication over the years. The company’s CEO name and address are available for general public and hence, it can be said, with utmost surety, that the app is legitimate. Unfortunately, it can not pave it’s way in the App Store due to it’s kind of operations which somehow conflicts the App Store Terms & conditions. This doesn’t infringe user or company’s right to use this app on their smartphones. The company, Fiksu, Inc., created FreeMyApps in the year of 2008. The founder and CEO of the company is Micah Adler and the headquarters is located in Boston, Massachusetts. From the past 6 years, FreeMyApps has succeeded in indulging more than 1 million people as their users (iOS as well as Android users). 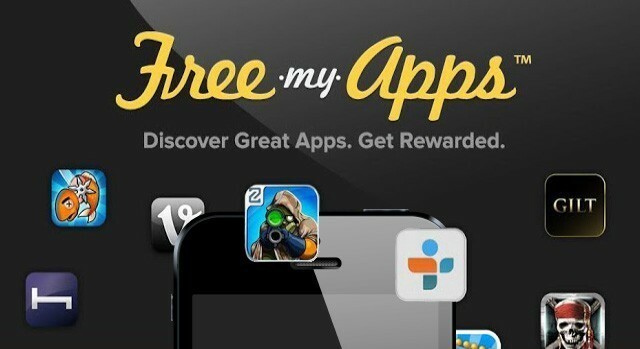 FreeMyApps operate differently in iOS and Android operating systems but their rewards are same i.e. Cost-free Paid-Apps and Gift Cards. In iOS, it has to be used as a web service whereas; the android users can easily download and install the application. The users go through the sponsored apps list given on the FreeMyApps site as well as on the app itself. After clicking on any app, the users are directed to the iTunes or Google play to download it. The application is installed and used for a while and voila! The user’s account is then credited with points corresponding to the apps. The users via gift cards (iTunes, Google Play, Amazon.com, Hulu+ etc) can redeem the allotted points. By tapping on any paid app the user wants, a promo code is given to him or her, which can be used to redeem the points and get the app for free. Another bit tricky, but surely, a great way to earn points is Referral system. For every referral, who click on any sponsored app you get 200+ credits. Sms, Email, Twitter and Facebook can be used to invite referrals, which can be helped by your friends, family and other people known to you. Unlike Feature Points, FreeMyApps has the option to browse through the history of redeemed apps. FreeMyApps provide slick design embedded on its website that allows the users to check the credits of every sponsored app with an ease and tutorials for the easy procession. It takes less time in getting the rewards of sponsored apps as compared to other applications that are similar to FreeMyApp. FreeMyApps does not have as many offers as other similar apps provide. Some of the offers include watching videos and advertisements, filling surveys, making calls, website sign ups etc.